How to get there: The village of Stryn at the very innermost part of Nordfjord is a good starting point. 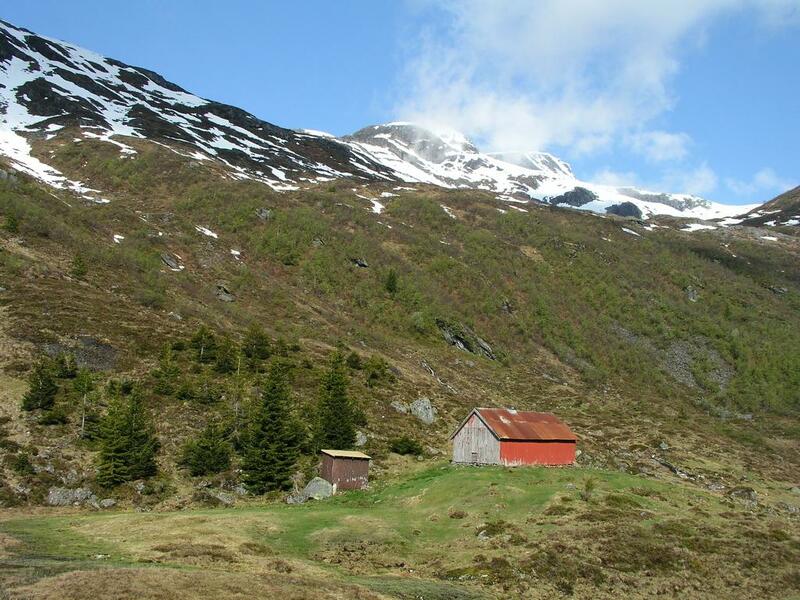 Stryn can be reached from Bergen by E-39 to Byrkjelo, then across to Utvik and along Nordfjord to Stryn. 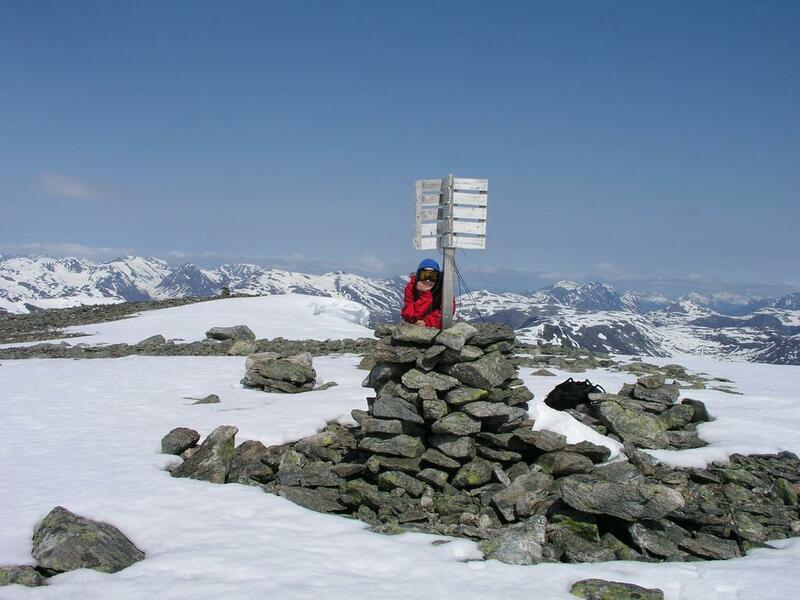 From the east Stryn is reached from Otta and across the Strynefjellet mountain crossing. From Stryn go towards Otta approximately 12 km, as you get to the lake Strynsvatnet, take the road towards Flo on the north side of the lake. Flo is 10 km after you make a left leaving the main highway. Drive to the very end of the paved road, park there. Route description: From the end of the road, locate a dirt road that heads straight uphill. There is a sign saying that motor vehicles should not be used. Follow this road as it winds its way uphill. There are two gates, after the second gate the road is slightly more level and a small creek is crossed. The road then again heads uphill before reaching the saddle just before Ångelsvatnet (540m). The lower Flo sæter is on the left, there is a road fork and a small road serving the sæter. 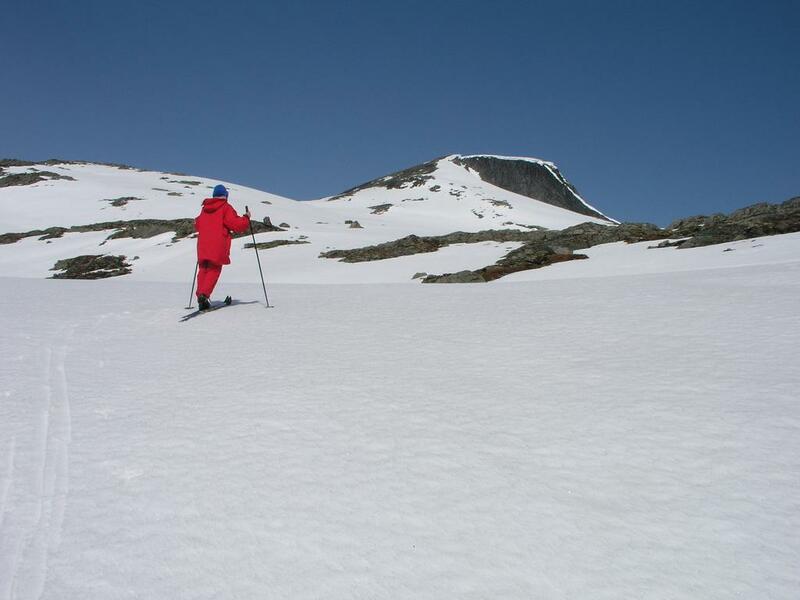 Look uphill, the summit is largely hidden, while Reinskredfjellet (1480 m) on your right is more prominent. 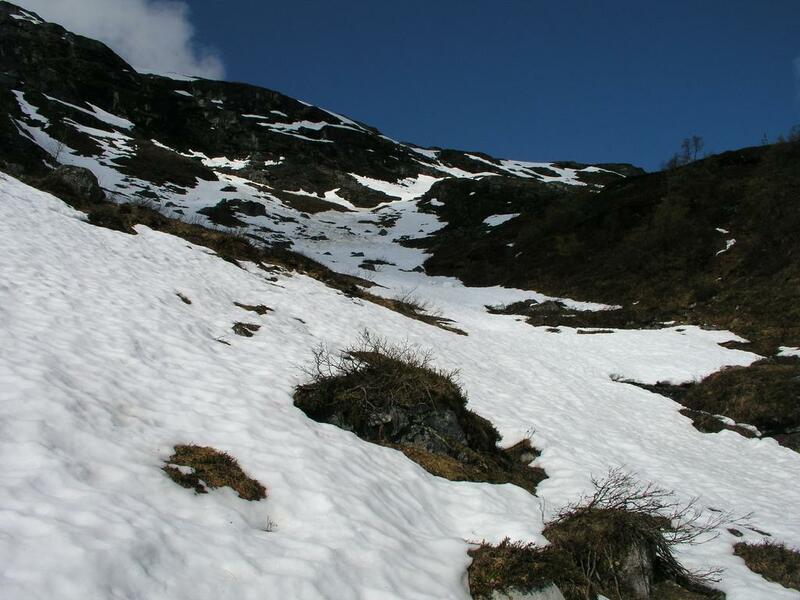 Climb west along gullies or grassy slopes (or find snow if you carry skis) until reaching about 1100 meter. Continue north-west picking the way along natural gullies and aim slightly west of point 1340. Eventually, Fedalsnibba will come into full view and its south ridge can be easily followed to the rather flat summit plateau. 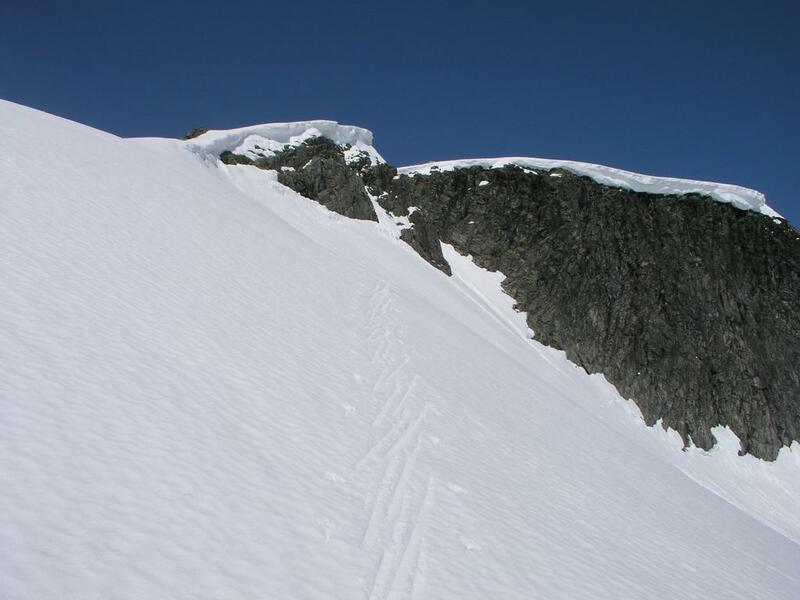 In winter, watch for the cornices that exist above the steep side east (right) of your ascent ridge. The overall route is (YDS) class 2. 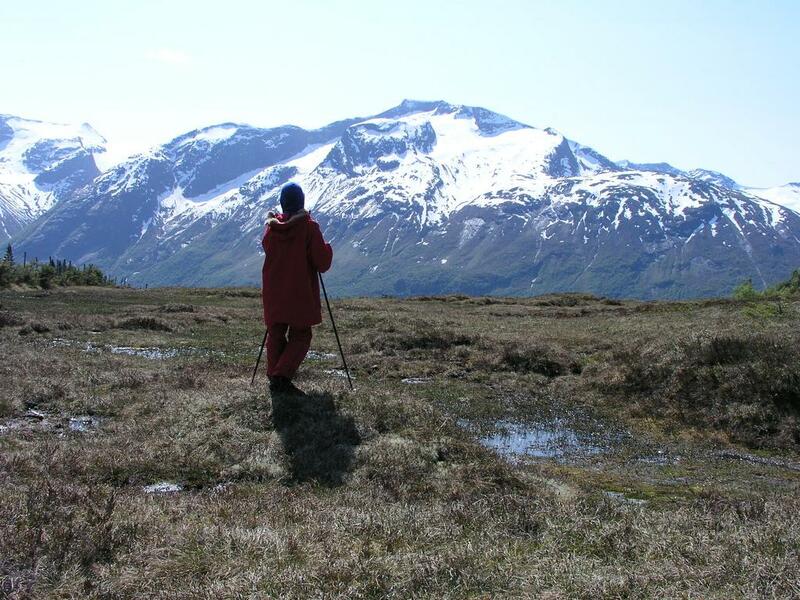 Comments: I did this hike with my son Pål Jørgen, age 14. We started at the Flo farm, elevation 200 m, at 0830, made the summit after 3:45. The weather was just fantastic, no clouds, no wind. We left the summit after 30 minutes and skied/hiked back down in 1:30. On this hike one starts considerably below the defining saddle, but then actually hike by the saddle just before the Ångelsvatnet lake (540 m). The interpolated saddle value is 543 m, which seems reasonable given that the lake is 540m. (The M711 map lists the lake at 534m, however, the 5 meter contour map has it at 540m). The saddle is 2.9 km (straight line) from the summit. The defining saddle, with a very nice view towards Skåla (1848m). Fedalsnibba , as seen from the Flo sæter. The mountain has a flat top and is visible behind and to the right of a false summit. We skied up this gully, following snow all the way to the horizon. The terrain here is steeper than it looks.